Cleanup crews mop up a sewage leak at Dodger Stadium on Tuesday, March 27, 2018. 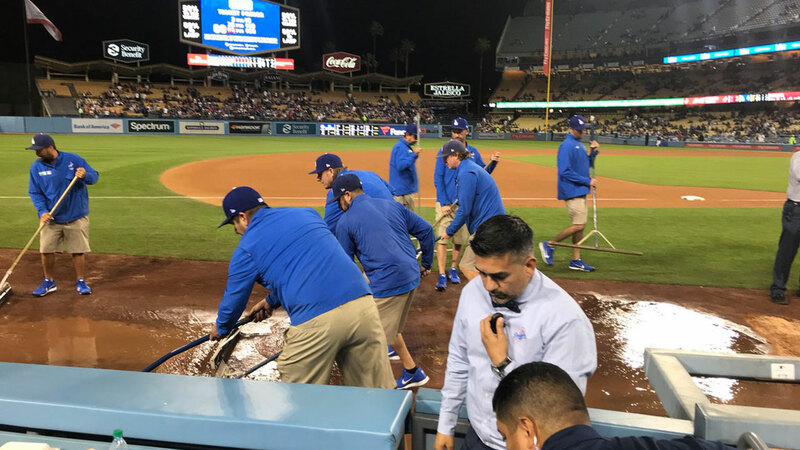 LOS ANGELES -- A pipe broke at Dodger Stadium Tuesday, flooding the field with sewage and putting a premature end to the final preseason game. The Dodgers and Angels were facing off in the finale of the preseason Freeway Series when the pipe burst in the bottom of the 5th inning. The Dodgers were up 4-3 at the time. The sewage flooded part of the field. The smell was described as quite powerful as cleanup crews worked to mop up the mess. "It smells really bad, man," one Angels fan in the stands said as he watched the cleanup crew work. "Look what the Angels brought to us," a Dodgers fan joked in response. Some fans were wondering if it was a bad sign for the season ahead. The Dodgers open the regular season at home on Thursday hosting rivals the San Francisco Giants. Click here for more stories, photos, and video on the Los Angeles Dodgers.